If my life were a book, I'm guessing this chapter would be called something like "San Francisco, Part II". Or "Michelle Moves to San Francisco.... Again". Or maybe even "San Francisco, All Grown Up". But I like the first title best, so we're sticking with it. Because "San Francisco, Part II" so far has been a lot more pleasant than "San Francisco, Part I". I really lucked out with my place in Noe Valley, my new neighborhood. There are a ton of lemon trees and quaint architecture, as well as a Whole Foods just a stone's throw away from my new studio. The Mission, my old neighborhood from "San Francisco, Part I", with all its trendy shops and restaurants, is pretty accessible with a quick, downhill walk. It's a sign of how much has changed in the last few years. In my early twenties, I embraced the Mission's grit — I loved walking around the hustle and the bustle, the loud noise and sirens. I relished knowing which streets to avoid because of their "sketchiness", and which Mission "danger dog" vendors gave you more onions and peppers than others. I could spend hours wearing tight pants and walk miles quickly wearing uncomfortable shoes, staying out late into the night and keeping a constant lookout over my shoulder as I returned home. But in the span of five years, the tables have turned completely. I no longer define a "good neighborhood" by its vicinity to the hottest restaurants and bars; instead, I want accessible grocery stores with a wide range of fresh produce, restaurants where I can get food without waiting in line for an hour beforehand, and parking. Living in a sketchy neighborhood is no longer a badge of honor that I wear (though... is the Mission even all that sketchy these days? Considering that rent in the neighborhood is one of the most expensive in the city — oh how times have changed!). I change into sweats immediately when getting home. And shoes? You don't want to see what I wear out and about every day. Am I boring and lame? Yes, absolutely, 100%. Do I care? Nope, not in the very least. Is this what growing up is? Stretchy pants and indifference to what's cool? Because so far, I dig it. Before I left Portland, I was lucky enough to receive a parcel from USA Pears containing a ton of Bartlett and green and red Anjou pears. 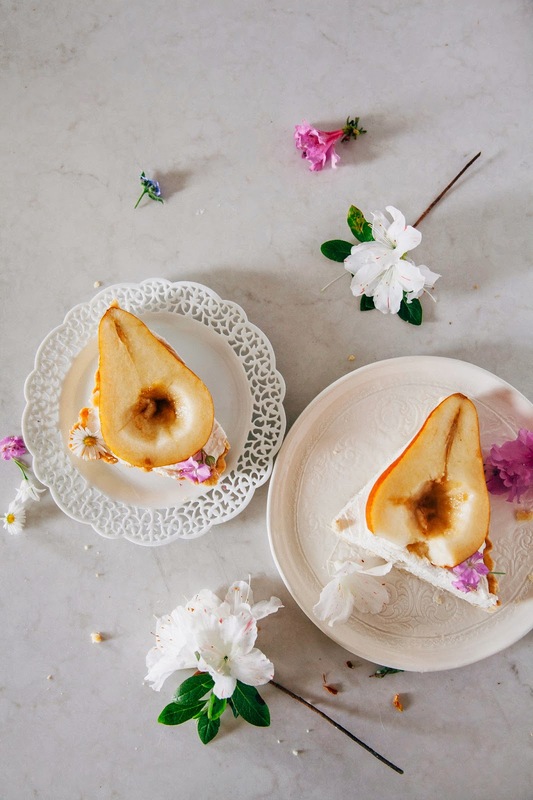 Pears are one of my favorite fruit — they have a ton of health benefits (one pear apparently packs 6 grams of fiber, which is almost a quarter of the FDA's recommended daily intake). Not only do they have a unique, light, and refreshing flavor, but they're incredibly versatile and pair well with a ton of flavors and ingredients (like wine or chocolate) in baked goods. This time, I'm pairing the pears (HA, see my pun there?!) with caramel. I've sweetened a batch of mascarpone whipped cream with some dulce de leche. 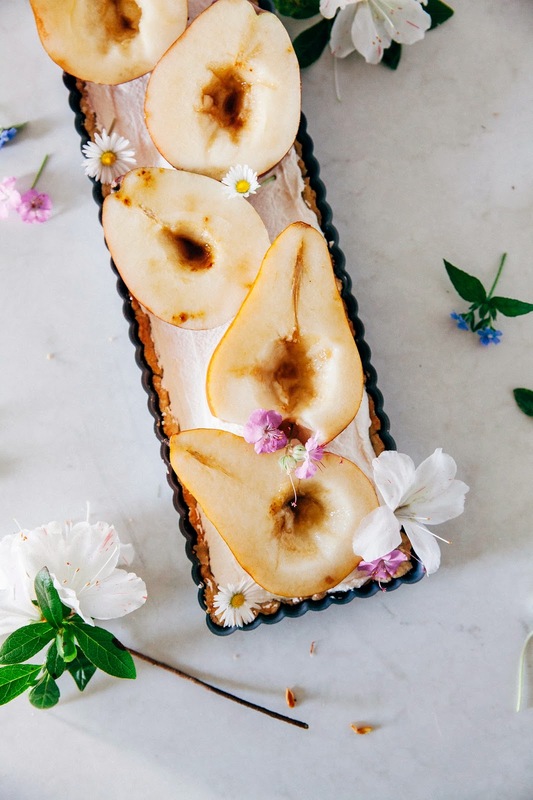 As for the pears, because I love their natural flavor so much, I kept it pretty simple — I sprinkled the tops of each pear with brown sugar and just let them macerate on the tart, bringing out their natural flavors and juices. 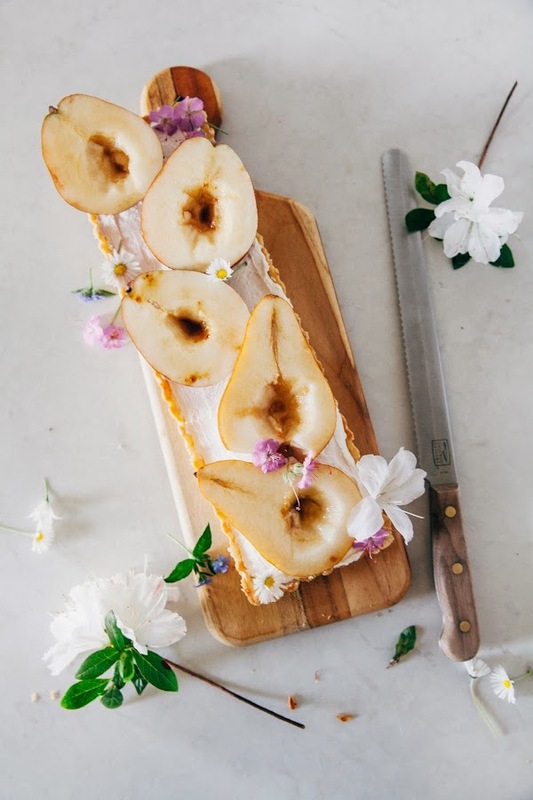 Each bite is a story of different textures: crunch from the brown butter tart shell and creamy fluff from the mascarpone whipped cream, finished off with the juicy sweetness from the pears. If you don't have the long, rectangular tart pan that this recipe calls for, don't fret! You can also make the tart using a regular 9-inch round tart pan. 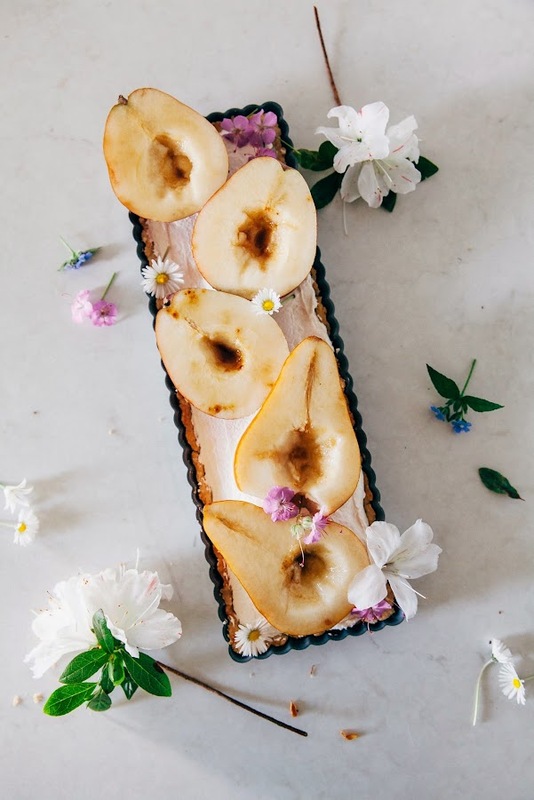 If using a round tart pan, however, I advise you to chop up the pears into 1-inch chunks, toss them with the brown sugar, and top the cream with the slices instead. The smaller pieces distribute across a round pan easier (versus keeping them whole with a rectangular pan). To flavor the mascarpone, I used dulce de leche caramel because I had a jar that I was trying to get rid of before my move. Feel free to use any caramel sauce you would prefer though — you can even make your own from scratch! 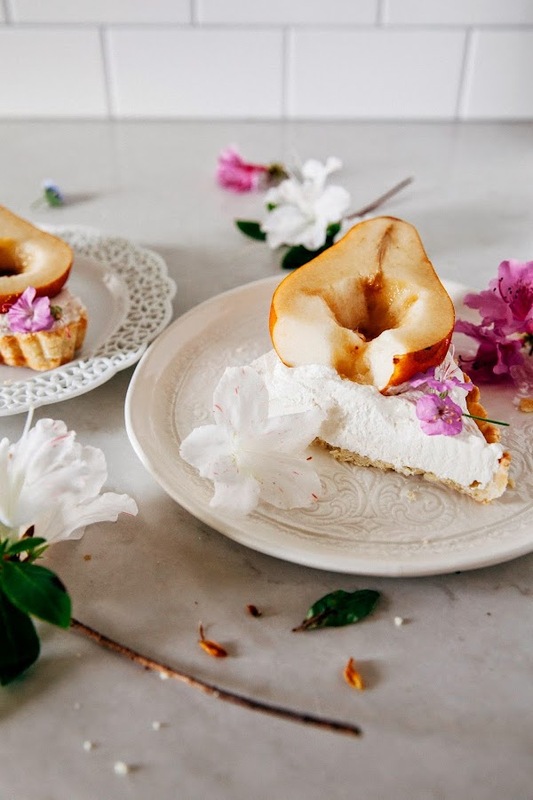 It's best to eat this tart immediately on the day its made; otherwise, it's a hot mess. 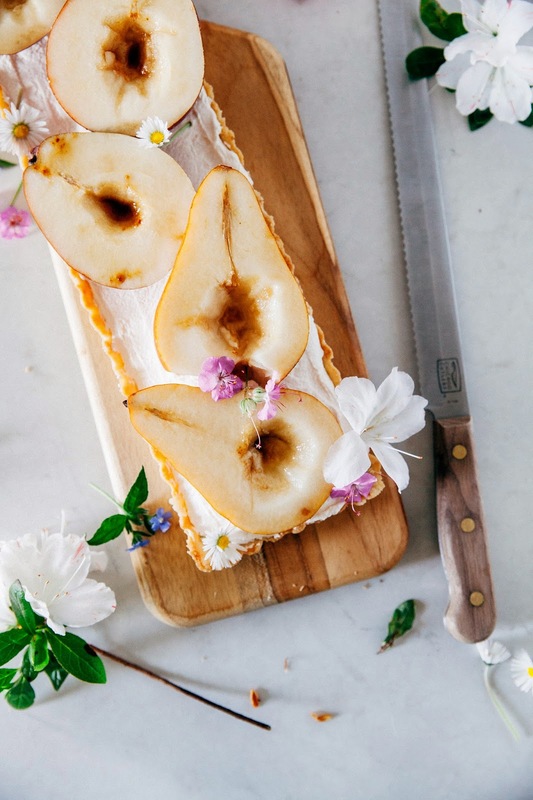 The tart will become soggy, the whipped cream will get deflated, and the pears will brown. To save time, you can make the tart shell the day before. The whipped cream comes together fairly quickly the following day. Slice the pears right before serving; if not, rub a little lemon juice on the sliced surface to prevent the pears from browning quickly. This will buy you a few hours. Once the dough is cool enough to touch, use the back of your hand to flatten out the dough onto your tart pan, using your finger tips to mold the dough up into the corners and sides of the pan. It will feel a little greasy and kinda unpleasant (the dough has the texture of mashed potatoes), but go with it. Once all the pans are lined, use a fork to poke several holes into the crust. Place the tart pan on a baking sheet and bake at 410 (F) for 15 minutes, or until the crust is light brown and starts to appear flaky. Once it does, remove carefully from oven and let rest on a wire rack. This crust is very forgiving — it should have hardly any cracks. If you are worried about cracks, you can reserve some of the dough to press into any cracks that might appear after the baking process — the residual heat from the freshly baked tart will bake the dough accordingly and patch up your crust. Once the crust is completely cooled, it is ready for filling. In the bowl of a freestanding electric mixer fitted with a whisk attachment, whip 1/2 cup heavy whipping cream on medium-high speed until soft peaks start to form. Once peaks have formed, add 1/4 cup mascarpone cheese and 1 tablespoon confectioners' sugar and continue beating for another 30 seconds until the cheese and sugar have been incorporated throughout the cream. Turn off the mixer and drizzle 3 tablespoons dulce de leche caramel and a pinch of kosher salt over the cream. Use a rubber spatula to fold the caramel and salt into the whipped cream, until well combined. Use an offset spatula to spread the caramel mascarpone whipped cream evenly across and inside the tart shell. De-stem and slice 2 1/2 ripe pears open. Remove the pear cores. Use a paper towel to pat the open slices dry, before sprinkling 1/4 cup dark brown sugar over each pear slice. Transfer immediately to the prepared tart shell, and serve immediately. Can the frosting be piped? Michelle this is SO pretty. And I'm so glad your experience moving to SF was good! Whole Foods a stone's throw away? Can't complain about that. Also, I do love pears as well but I don't eat nearly as much of it as I should! Gorgeous, as always. Thanks Betty! Holler when you're in the area, I'm excited to hang out! As someone who lives in the Mission, most of it is not really gritty anymore, just an interesting mix of yuppie and Latino. I love the neighborhood you're in there, I run past that Whole Foods about once a week. Congrats on the move, and good luck adjusting to the new kitchen! For sure! It's a world of a difference from when I lived there back in 2010-2012. Walking around now is almost surreal; it's so much safer and there's a ton more restaurants and fancy shops around. I also feel like it's a little cleaner, but I might just be making things up at this point. I love Noe Valley, and so glad your move went quite smoothly! This tart is calling my name! That caramel mascarpone could not be dreamier. And fistbump to sweatpants and being boring-lame-AWESOME! I've been so loving your snaps of your new neighborhood on IG and so happy you're loving your digs. Yay to all of this!! This tart is gorgeous, Michelle! I can't get over the prettiness. And these flavors?! Love. I love that you paired brown sugar and caramel with the brown butter, it just sounds so comforting and warm. Not to mention absolutely gorgeous too. I love seeing the instagrams of SF, it makes me excited for my trip to SF in a couple weeks! it seems like you are settling in SF very well. i have been to SF only once and absolutely loved it, cant wait go back there. So glad you're enjoying your new life!! I can't wait to hear about your experiences (SF has always been a "must-visit" place for me! Also, this tart?! GORGEOUS! Love the pears! You are totally not boring and lame for being a sweatpants creature (aren't we all? ), plus your baking is the opposite of lame :) Love this tart! love this! i usually think of pears as a winter/fall fruit and i'm having so much fun using all the seasonal produce available these days (cherries!! rhubarb!!!) but I'm totally saving this for the fall! also, when do we get to see pictures of your new kitchen? i'm sure it can't compare to your old one, but i'm curious to see it! So beautiful! i'm also a pear lover - especially the aromatic varieties like red d'anjou - heavenly! I love this post! Everything looks so beautiful. I have spent exactly 5 hours in San Francisco (long enough to land, eat chicken & waffles at Farmer Brown's, and get back to the airport)--and you are absolutely giving me the urge to explore a little more. Best of luck in your new digs! This tart looks freaking awesome as always, and I think that truly not giving a crap is the surest sign of growing up. Huzzah for sweatpants! Yeah, my roommate during my freshman year of college grew up in SF and has stories about not being allowed to go to Dolores Park as a little kid because of all the needles and broken glass in the grass. Now, it's like, the spot to see and be seen on sunny days! Crazy. Thanks Cynthia! Sweatpants for life. Let's start a sweatpants club. We can all just hang out together and eat pizza in our sweatpants. I hope you do! It's a really unique city; there's no place quite like it! Thanks Katrina! I hope you make it out here one day; we can hit up all the bakeries! Thanks Lynsey! It's funny how priorities change — I'm not even in my 30s yet and I already want peace and quiet, lol. "sweatpants creature". Lol, I love that phrase. Maybe I'll update my Twitter bio to be that! Yeah, pears are most definitely a fall fruit, but I just couldn't resist when I received those huge box of pears. Oh gosh, the new kitchen is not worth photographing. It's functional, but tiny and generic. My new stove can't even fit a half sheet pan. But more on that later, more on that later. Farmer Browns is amazing!!! They make one of the best chicken and waffles I've ever had. They had a little takeout window by the train station called "Little Skillet" that I used to hit up all the time. I think it's time to go back! This looks stunning. I seriously need to buy one of this tart tins too as they make tarts that look so beautiful. Are they hard to line with the pastry? I love the photos in this post! Nope, the rectangular pan is pretty forgiving! I found it more forgiving than the round pans. The only thing that's a bit of a pain are the corners. Hahah, classic mom comment. I love it. And yes!!!! I am all about your SF game plan. So stoked! Unfortunately I'm not actually living in one of the beautiful houses in the neighborhood; more like the studio in-law apartment of one of them. It was the closest I could get, lol. Seriously -- who are all these people! Ugh.... Michelle! Seeing "A Baking Blog in San Francisco" just doesn't seem right still. But that being said, I'm glad SF Part II is going better. And being a grownup is totally ok. Uncomfortable shoes and staying out late are definitely overrated. Sweat pants is where its at for sure. This is just so beautiful. I don't think I could even eat it! You literally make art with your food! Also, so happy you are loving your new home! ya!! Michelle this is just beautiful, I love your photography. You make San Francisco sound so pleasant, I'm glad you are enjoying it there (and wearing stretchy pants with abandon, I'm with you on that one)! It's amazing how quickly an area can change isn't it? And, generally, just how quickly what we want out of an area can change too. I'm all for stretchy pants + the proximity of a Whole Foods. That's pretty much all you need in life. So glad the move has gone well (and so impressed you managed to make blog stuff in advance with everything else that was going on!). This tart is a real beauty. Pear and mascarpone and brown sugar and caramel?! OMG yes! And boy do I feel you on the kitchen shift. When I moved from SF to LA I actually lost about 100 square feet of kitchen space, which is just so scary I shudder to think about it. Someday I'll find reason to move from where I am now, but in the meantime, I've developed some very crafty ways to deal with the kitchen cramp. Welcome back to Cali, baby!